Social media management isn’t as easy as sporadically sending out Tweets and posting pictures to Instagram. That might be fine for your personal accounts, but when it comes to marketing a business, there is a lot more involved. Connecting with influencers, finding the right content to publish for your audience, running ads and creating custom content are just some of the daily tasks that come along with social media marketing. In order to be more productive and keep some of your sanity, it’s a good idea to load up your social media apps toolkit. Canva is one of the most popular graphic design apps for creating visuals in the social media industry. Whether you want a perfectly-sized Facebook Cover or a custom graphic to advertise your latest sale on Twitter, Canva makes it as simple as dragging and dropping the different elements into your image. You have access to a huge library of free and paid photos, graphics and fonts that allow you to make professional looking social media graphics even if you have zero design skills. There’s also a Design School that’ll allow you to sharpen your skills a bit. Stop resorting to boring stock images and see what you can create in Canva. In order to earn new social media followers and keep your current ones, you need to share great content. The best type of content is relevant and helpful for your target audience. 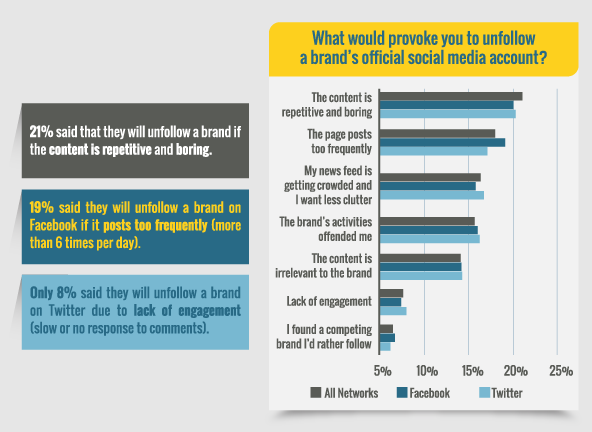 One survey found that 21% of people would unfollow brands on social media because of boring content. It’s an ideal social media app because you can use the information you gather from BuzzSumo to figure out what type of content you should create and share in order to get more traffic and social media engagement. You might find that listicle or “how-to” articles get the most shares. Then you can start to share more of that type of content to generate additional interest for your social media posts. On top of that, you’ll also have a better idea of which influencers to reach out to on social media. As you build relationships, you’ll be able to get your content organically shared by top influencers in your industry. BuzzSumo will give you a good idea of what type of content to share. But you’ll also need a source to get a steady stream of blog posts, videos and articles to distribute. That’s where Scoop.it comes in. Scoop.it is a content curation tool that will crawl the Web for content related to keywords you enter. The app will also give you a list of relevant articles to share around that keyword. One great benefit of Scoop.it is you’ll get to share content from a variety of sites. A lot of businesses make the mistake of only sharing content from the same two or three blogs, including their own. When you’re constantly sharing content from different sites, you have an opportunity to connect with more people by including an @mention to the original source of the content. The content creator will more than likely Retweet you, which gives your business exposure to a new audience. The more influencers you mention, the more reach you have. Within Google Analytics, you can track which social media platforms are bringing in the most traffic, which pages on your site are getting the most social traffic and even what your social media ROI is. Nearly any type of data correlation between your website and social media that will help you make decisions can be found through Google Analytics. Plus, this tool connects with some of the other social media apps on our list, so it makes for easy integration! Automation can be extremely helpful for social media marketing. However, you have to be cautious of what you choose to automate. In case you’re unfamiliar with IFTTT (If This Then That), it’s a very handy tool that lets you connect different apps into what’s called a “recipe” to streamline your workflow. For instance, maybe you want to automatically post the photos you share on Instagram to your Tumblr page or a specific Pinterest Board. IFTTT makes it possible by connecting your social accounts and automatically performing these tasks without the need for additional work. The beauty of IFTTT is that its capabilities are only limited to your imagination, and you can make it work to fit your needs. Think of some of the most tedious and time-sucking social media tasks that you’re doing manually. Now, head over to IFTTT and see if there’s a way to create a recipe to automate it. Here are some time saving Instagram recipes to get started. A social media dashboard is one of the first social media apps you should add to your toolkit. The native interfaces you get with social media platforms like Twitter, Facebook and LinkedIn weren’t made for marketers. They’re meant for casual users, so each platform doesn’t have the functionality businesses need to be efficient. Your dashboard will serve as the home base for all of your company’s different social media profiles. Instead of having to log into five or six different accounts, you access everything from Sprout Social. It’s also ideal for agencies and companies that have multiple people who handle the social media marketing efforts. You can track who’s publishing content, assign tasks to specific team members, insert message approval systems and communicate with your team in the dashboard instead of emails. A social media dashboard is a necessity for any business that does social media marketing. Facebook has one of the most robust advertising platforms online. The data the social network collects from users allows marketers to ensure their ads are being seen by their target market. When you’re only running a couple of ads with a relatively small budget, using the native Facebook Ads platform is perfectly fine. But once you start to get more advanced, run multiple campaigns and do more split testing, staying organized can become a hassle. AdEspresso is a Facebook Advertising tool that makes running multiple ads much easier. Not only does AdEspresso allow you to better manage your ads, but the app helps you optimize ads to improve your ROI by analyzing them and providing actions you can take to get better results. Even though Facebook Ads are relatively cheap compared to other advertising platforms, you can waste a lot of money if you don’t know what you’re doing. If you haven’t been seeing very good results with your Facebook ads or have been struggling to stay organized, give AdEspresso a shot. Have you ever came across an awesome photo on Instagram that you wanted to share with your audience? Unlike Twitter, Pinterest and Google+, Instagram doesn’t have a way to let you share content from other users within the app. You can only like pictures and leave a reply. This forced people to use workarounds like using screenshots and cropping out the image they wanted to share. That’s inconvenient, inefficient and sometimes unprofessional looking. Instead, the Repost for Instagram app allows you to easily repost content you find on Instagram and give credit to the source. This is a good way to start networking with other Instagram users, or even share content across multiple company profiles. For instance, if the entire company attended an event and you post a group selfie on the company page, everyone else can repost it to their individual accounts too for more exposure. What Does Your Social Media App Toolkit Look Like? It’s amazing how much more you can get done when you have the right tools at your disposal. Add these eight social media apps to your arsenal to find and share better content, streamline your processes and become a more effective social media marketer.